1. El-Wasta: This form of nepotism is widely used in the Arab world and consists of using one’s connections or influence to get things done through favoritism rather than merit. It reaches services such as employment, promotion decisions, traffic tickets, special car plates, tainted car windows, administrative transactions, customs, bookings, and many other if not to say everything. Lebanese tend to speak loudly about El-Wasta, as it gives them the feeling of superiority and the sign of a well-connected individual. 2. The nearby beach and mountain story: Who didn’t tell this story to foreigners at least once in their life? This fairy tale brought so many curious tourists to Lebanon, thinking they can go ski and in a matter of 30 minutes put their swimsuit and enjoy the sun at the beach. Well in reality it’s doable, but it will take you a lot more time with the traffic jam, to end up on a neglected beach in a freezing winter weather. 3. Politicians: Lebanese are so proud of their politicians that they’ll die for them, they consider them like superior human beings leading them to salvation. Sometimes a small political argument can lead to a big fight just by insulting a politician or disagreeing with his ideology. Ya Za3im, Khaweja, Ya beik, Ya rayyess, sheikhna, ya tej rasna,… are designations used by the Lebanese to show their inadequacy vis-a-vis their leaders. And as long as you keep voting for a person rather than an ideology, you will remain a slave for these same politicians. 4. 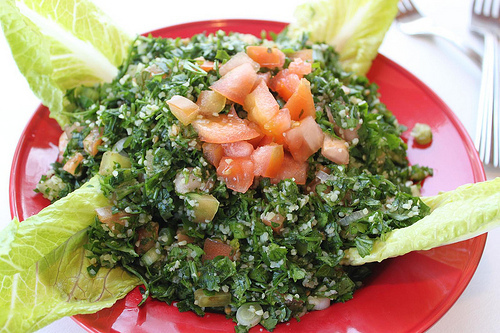 Tabbouleh: The famous salad became a must have on every family’s table in Lebanon. Everyone feels involved in giving his/her opinion while eating it with remarks such as “Needs more lemon”, “tabboultik taybeh”, “Did you finely chop the parsley?”. Sometimes it is also the main criteria behind rating the quality of food in a restaurant. In 2009, Tabbouleh was so important for Lebanese that they made a 3.5 ton plate, which made them enter the Guinness World Records. 5. Hi! Kifac, ca va? : That is the fastest and shortest way for a Lebanese to introduce himself as a tri-lingual speaker. He or she feels so proud of the ability to communicate in three major languages, in instance Arabic, English and French. Even American movies in theaters are subtitled in Arabic and French in a way to meet the market’s need. Unfortunately, the language of Molière lost some of its popularity in Lebanon to Uncle Sam’s global language, driving some articles to be written in English.